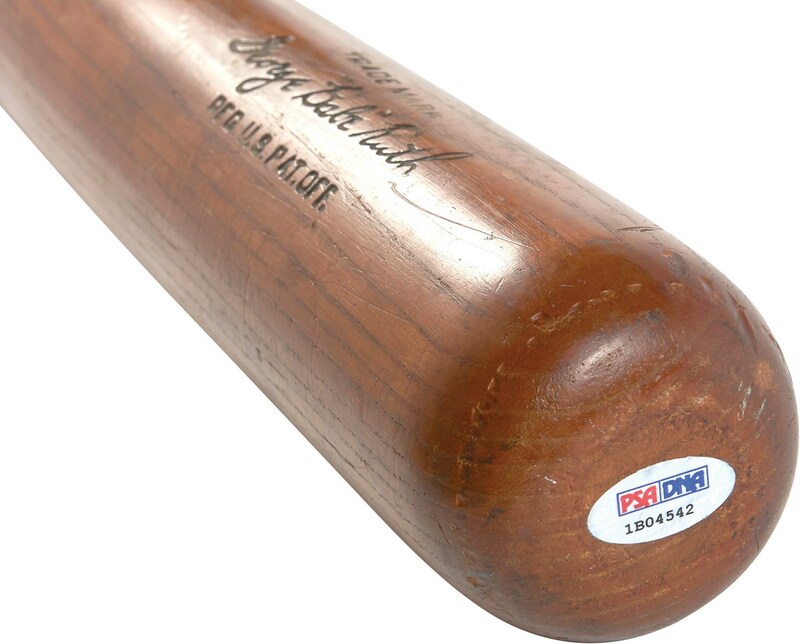 The mythic status of Babe Ruth's called shot makes it one of the most well known plays in sports history, and this may have been the bat Ruth used to predict the trajectory of his legendary home run. 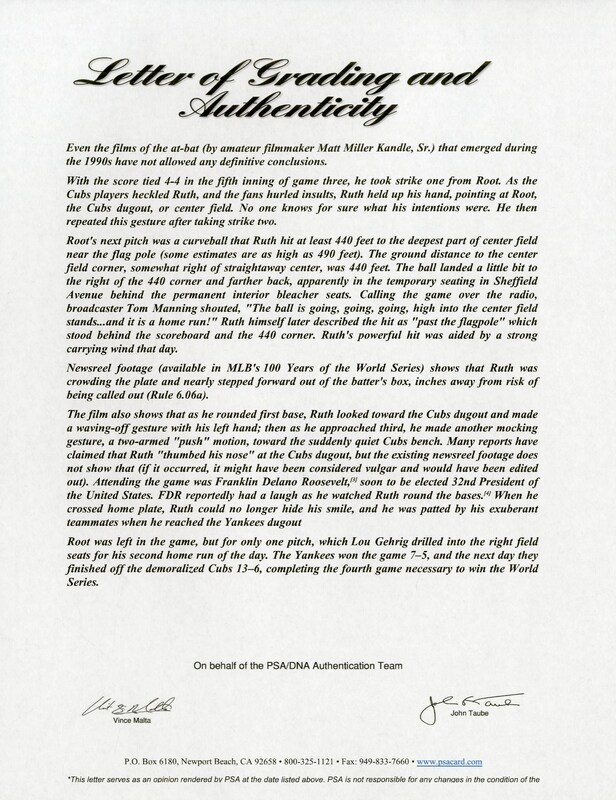 In the fifth inning of Game 3 of the World Series, with the score tied 4-4, Ruth stepped to bat against the Chicago Cubs' Charlie Root. After taking strike one, Ruth then made a gesture that remains ambiguous to this day despite video of the event. It is possible he was admonishing Root or the Cubs bench, which had relentlessly heckled Ruth that afternoon, but is believed to be him pointing his bat toward center field: a declaration that he was about to deposit a ball in the center field bleachers. After taking another strike, he then repeated the gesture. Unbelievably, on the next pitch, Ruth cracked a towering shot to the exact location he may or may not have pointed, estimated to be 440 feet from home plate. Initially, Ruth claimed he was just pointing to the Cubs bench to remind them he still had one more strike, but as the story gathered momentum Ruth lent it credence, later saying of the event, "Well, I looked out at center field and pointed. I said, 'I'm gonna hit the next pitch right past the flagpole!'" Whether or not Ruth intended to call his shot, he did consider it the best ball he ever struck, later saying, "As I hit the ball, every muscle in my system, every sense I had, told me that I had never hit a better one, that as long as I lived nothing would ever feel as good as this one." Though the called shot bat has never been found, this one makes a pretty compelling case. 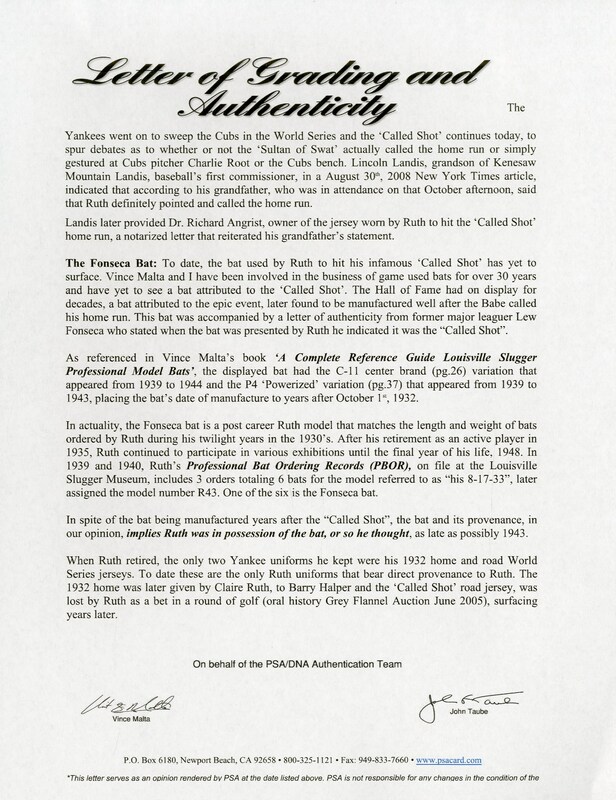 The Baseball Hall of Fame at one time was in possession of a bat believed to be it, but it was later found the bat was produced after Ruth's career. 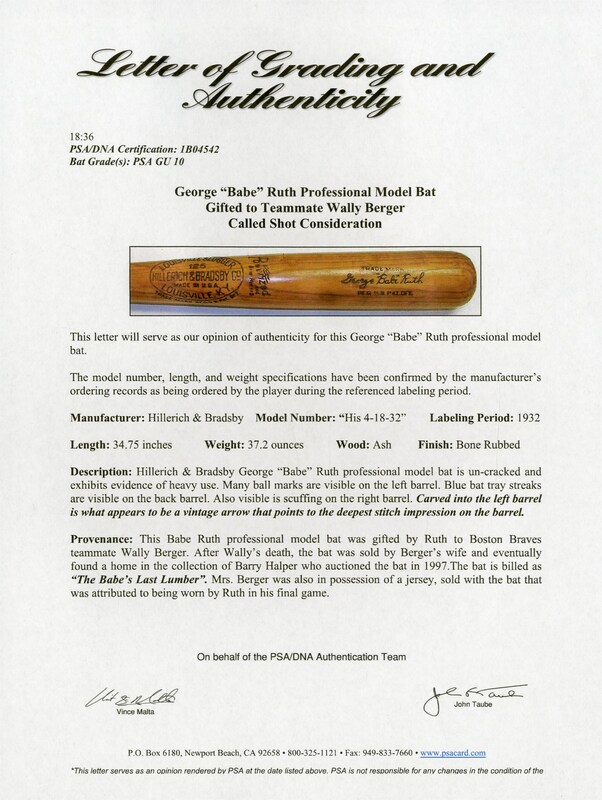 Originally, this was thought to be Ruth's last bat, gifted by The Babe to Wally Berger, but as fate would have it this was not the one. 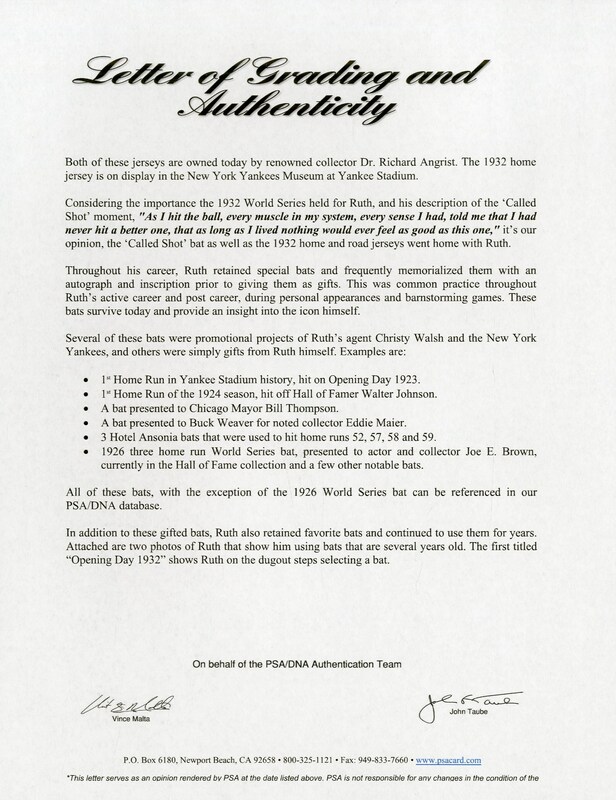 Ruth often used to keep his favorite bats for years. This bat was made in 1932 and matches to his order on 4-18-32, and a photo of the called shot shows Ruth using a 1932 bat, so it stands to reason this could be the one given his penchant for retaining preferred bats and the corresponding order. Further evidence comes in the form of a carved, vintage arrow pointing to the deepest, hardest hit ball mark on the barrel of the bat. 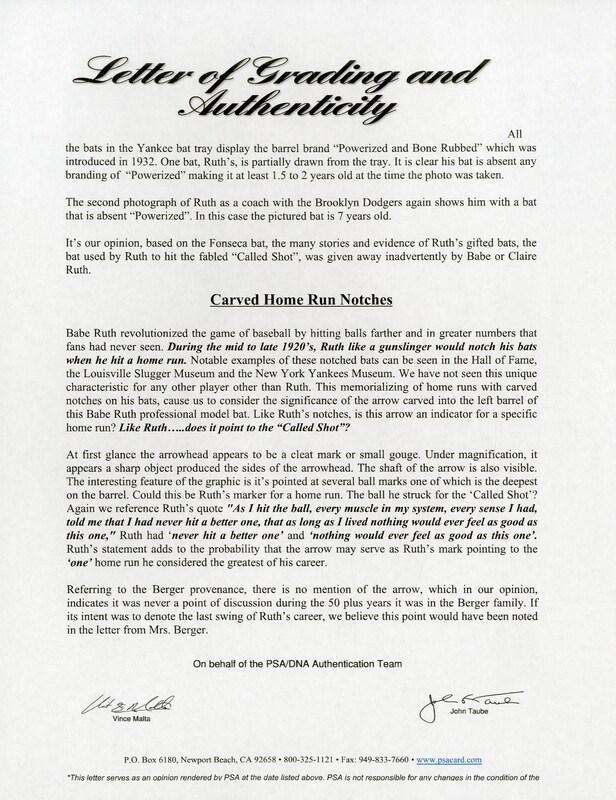 Ruth is known for the unique habit of making notches on his bats denoting important home runs, so this arrow could be pointing, like Ruth's called shot itself, to a home run of particular significance. 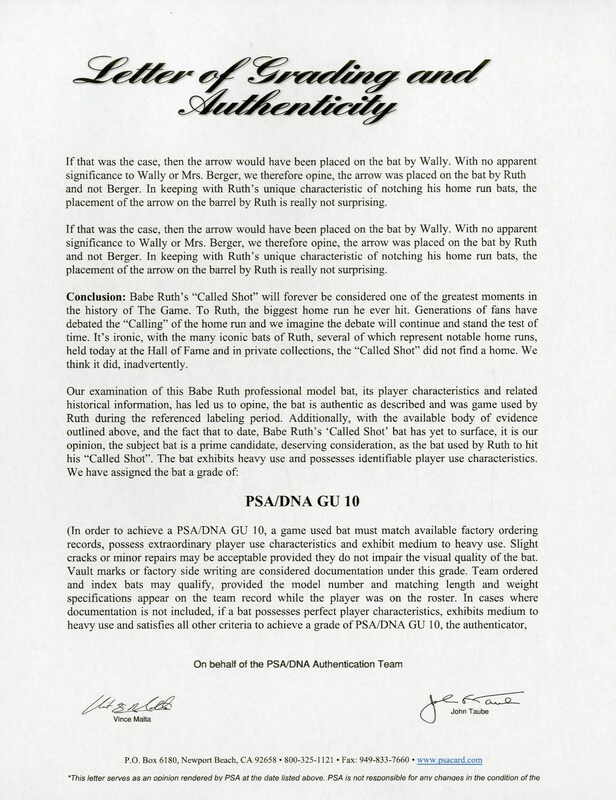 Irrespective of its place in history, the bat is truly special and one of the finest Ruth specimens ever offered to the public. 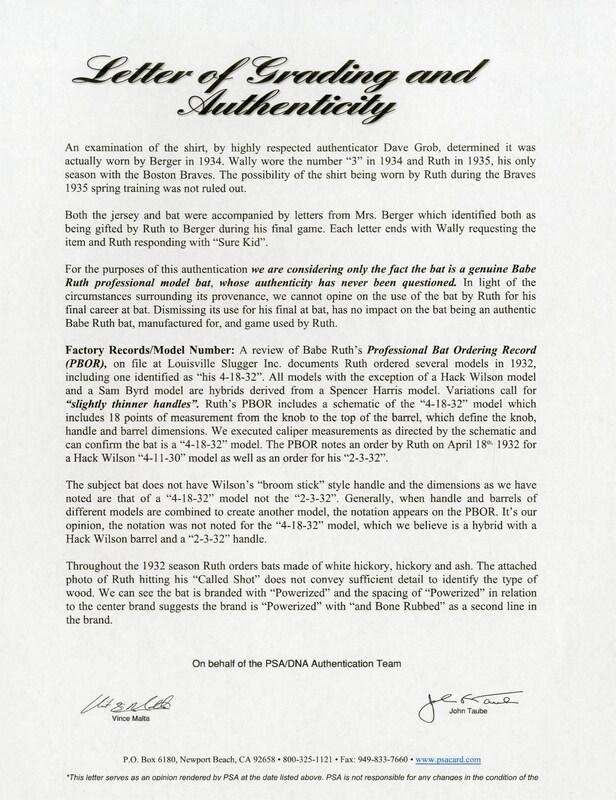 It measures 34.75" and weighs 37.2 oz., and is graded a perfect 10 by PSA. 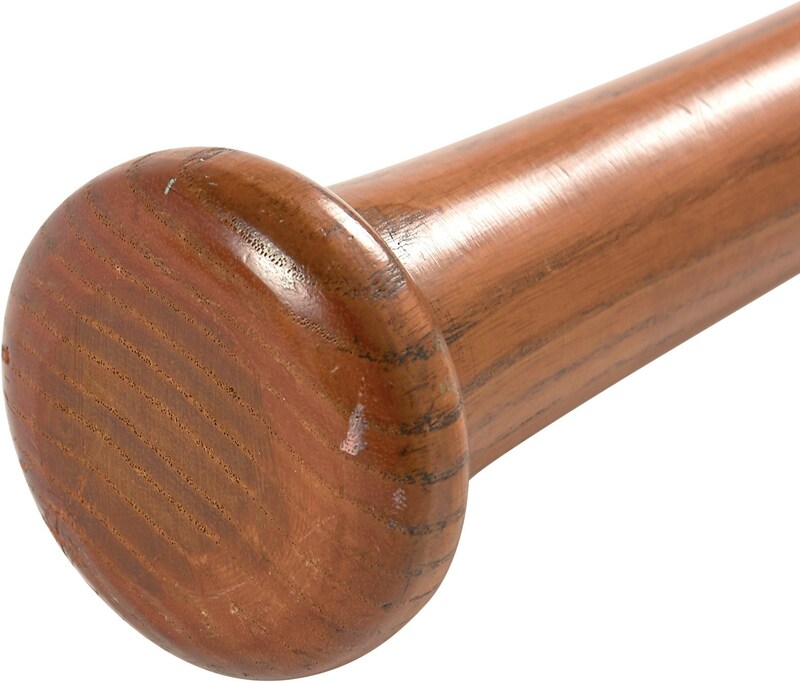 It has seen terrific use with deep stitch and ball marks on the left barrel, as well as blue, gray, and green paint transfers from bat racks. The bat is uncracked, and carved into the left side of the barrel is an arrow pointing to the very deepest stitch indention. It comes with a comprehensive, 14-page PSA report and LOA. 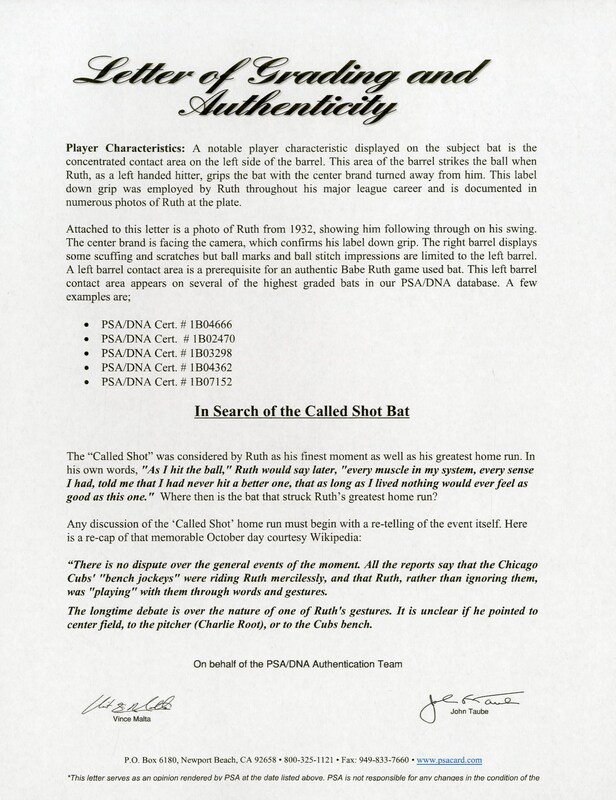 To quote the report, "It's ironic, with the many iconic bats of Ruth, several of which represent notable home runs, held today at the Hall of Fame and in private collections, the 'Called Shot' did not find a home. We think it did, inadvertently."